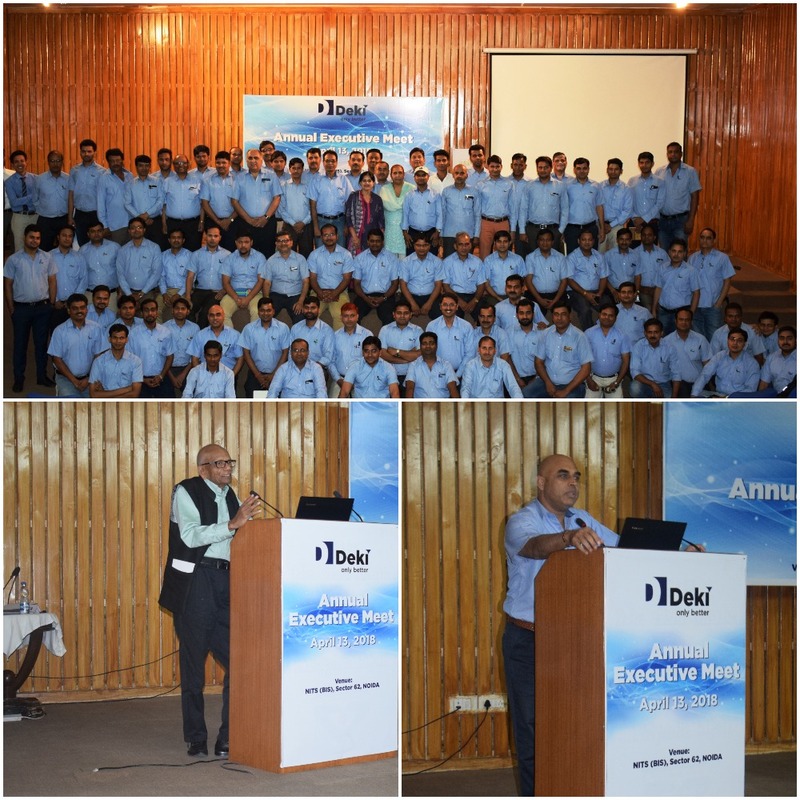 Deki's Annual Executive Meet was held on 13 April 2018 at NITS (National Institute for Training & Standardization) in Sector 62, NOIDA. All executives, including the Chairman, Mr Jai Kumar, attended the meet. Heads of Departments presented their department's performance report for 2017-18 and the expected trends for 2018-19 including highlights about their plans for the year and ahead. Mr Anil Bali, Vice President, shared the business plan to achieve a minimum 25% turnover growth over the previous year and the single page strategy for 2018-19 for achieving the company's objectives. Mr P Shanker Raj, Vice President (Technical) spoke about improving process capabilities and product cost optimisation. He also updated the executives about the automation and productivity projects, improvement plan for box type capacitors, new product development, diversification and team work. Mr Vinod Sharma, Managing Director, shared his thoughts and views to inspire the executives to achieve the company’s goals. He spoke about improving teamwork, personal efficiency and effectiveness and reiterated the core values and culture of the company. Mr Jai Kumar, Chairman, while addressing the gathering, talked about business risks and rewards. In the last session, all executives were divided into eight groups for a brainstorming session of 45 minutes on a unique topic like achieving a 100% of the business plan, improving employee happiness, adopting new manufacturing process – Industry 4.0, etc. At the end of the group exercise, each group leader presented the group’s strategy for achieving the objective set for their group's topic. The meet ended over a delicious lunch and a group photo session.